Pictured above are Dr. Kent Greer and his wife, Annie. They’re holding ten-year-old Cavalier. Cavalier was surrendered to the shelter because her mom, the much-loved April, had terminal cancer. Cavalier now lives on the Greer’s family farm. 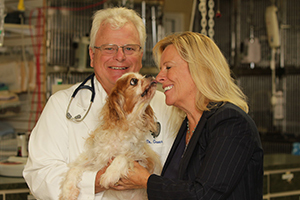 More than 36 years ago, Dr. Kent Greer, a second-generation veterinarian, was a young veterinary graduate who decided to build what was to become a new concept in veterinary hospitals for Central Florida. Drawing on the example of his father’s veterinarian practice, he opened River Oaks Animal Hospital in 1985. This facility then offered in-house diagnostics with the very first IDEXX blood machines in the United States. This set the highest standard for services offered at his first animal hospital. In 1995, Annie (now his wife), a favorite local animal behaviorist and a radio personality, joined the practice, and they soon married in 1996. In the years to follow, Dr. Kent and Annie wanted to expand their services into other counties. In 2005, they purchased the East Lake Animal Clinic, which is close to their working family farm near Apopka. As the years went on, they saw an opportunity to create a unique pet resort, which is combined with their advanced medical services. Thus, Pet Care Center of Apopka was built. They converted a family residence and added on a million and half dollar state-of-the-art boarding facility that retained the integrity of the beautiful six acres of woodland and grasslands on the property. Next, they added a swimming pool, especially designed for dogs, that addresses the increasing interest and provision of rehabilitation and alternative therapies for dogs. children love to help out on the family farm by feeding all the animals. It’s obvious that their personal commitment to you is grounded in making sure your pet receives the finest in veterinary care by providing it with the best technology and diagnostic tools. And because of their tremendous love for animals, you’ll readily see each and every pet is treated just as if it is one of their own. The Greers know that the key to providing your pet with a long, healthy and happy life is preventative care. This is why thorough pet wellness checkups are a standard piece of the pet care offered at all of their animal hospitals. To make things easier, their practice offers complimentary first exams and a free second opinion for serious cases, as well as other incentives. Also, note that vaccination costs are less expensive than offered at many of the chain pet stores. Maintaining their pricing structure for the past nine years, they continue to offer outstanding service for extreme value. Dr. Kent and his staff understand that accidents and illness will happen even to the healthiest of pets. This is where their facilities really excel. The skill and expertise offered is enhanced by modern diagnostic imaging equipment, in-house medical testing capabilities, complete surgical suites, and a wide range of internal medicine knowledge and resources. Requests for appointments can be done easily online through their website and on their Pet Care Center of Apopka Facebook page with just a simple click of a button. While you’re there, make sure to “Like” them on the Facebook page. Pet Care Center and Pet Resort of Apopka is conveniently located at 2807 North Rock Springs Road, less than a quarter mile south of Ponkan Road. Visit their website at www.centralfloridavets.com or call 407-884-8924 for tours or for more information. They are open six days a week.